Heads up, Tom Scharpling fans! Mr. Best Show on WFMU and his team decided that one podcast just isn't enough. Today he has just unleashed a second podcast: Best Show Gems! Best Show Gems is The Best Of The Best Show On WFMU: a twice-monthly podcast featuring highlights from the full radio show. Classic Scharpling and Wurster calls, amazing phone-ins, random weirdness and more! It's a perfect way for a beginner to get on board, or for a longtime fan to look back and remember when. Click here to subscribe via iTunes or head over to our podcast page. WFMU is pleased to unleash a new podcast today! Lou Z (of The Push Bin fame) hosts Tale of the Twelve. Here's what to expect: A half hour show show celebrating the bleeps, bloops and beats of pre-millennium electronica and dance singles in the twelve inch format. Lots of forgotten and discarded artists, pseudonyms, sub-genres and remixes from the late 80's and 90's thrown at you in a down and dirty fashion. Subscribe to Tale of the Twelve via iTunes by clicking here. 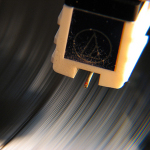 Head over to WFMU's Podcast Central to check out all of our great podcast offerings. 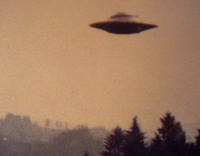 WFMU has added yet another great podcast: Night People! Your hosts Dave and Andy tackle pressing issues like paranormal activity, UFOs, ghosts, magic, vampires, socks missing from your laundry pile, and other unexplained phenomena. What fun! Two of WFMU's newest shows are now also available as podcasts! 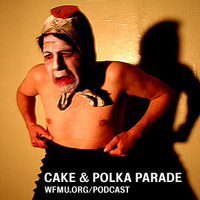 WFMU is pleased to introduce a brand new podcast to our stellar roster of freeform in feed form: Cake & Polka Parade with Fatty Jubbo! Head over to our podcast page or click here to subscribe via iTunes. Fatty Jubbo provides Beware of the Blog with weekly injections of sublimely disturbing art links, and also pops up as a fill-in for WFMU's web-only programs every so often (archives here). You won't want to miss out on his new podcast, which he describes as "a classy program of children's records, no-wave, noise, prog, 20th century classical avant-garde choral pieces, concrete sound poetry, weird foreign pop and audio debris. Crackpots, incompetents, geniuses... and they speak the gibberish too!" Mike Lupica is resurrecting his glorious Anti Static podcast during this crucial time, when we Americans are desperately in need of some light at the end of this tunnel we've burrowed ourselves into. Remember mail order? Remember 'zines? Remember economic prosperity? Remember when mall graffiti and a New Bomb Turks t-shirt actually meant something? Bring the '90s back! Well, at least get yourself a bi-monthly dose, courtesy of Mike. Head on over to our podcast page to reacquaint yourself with better times. Or click here to subscribe via iTunes. We would like to remind fans of the Best Show on WFMU that the program is also available as a podcast. Every week, you can easily get automatic digital delivery of all the turlet talk you require and desire. Head on over to our podcast page or click here to subscribe using iTunes (or check out this page in the iTunes Store). Tom Scharpling and Jon Wurster were recently hailed in the Onion's A.V. Club Blog, and even the iTunes store is showing some love (right up there with Michael Jackson, see below)! When a celebrity dies, the varied newspaper obituaries rarely reveal anything that isn't common knowledge. However, in the case of the late George Carlin, even some of his most fervent fans were likely surprised to learn he was in an early sixties comedy team. Several learned for the first time he had been a gifted mimic, his abilities putting impressionists like Rich Little to shame (perhaps not a hard thing to do). 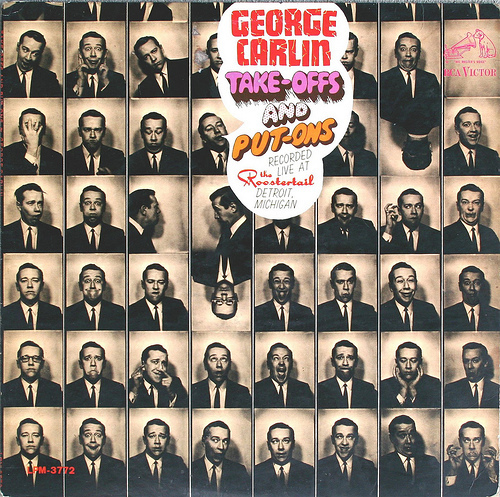 The early version of George Carlin has been immortalized on Take Offs and Put Ons - what is commonly, but erroneously referred to as his first album. 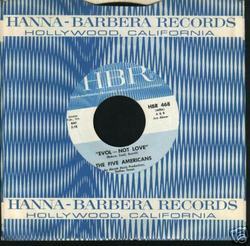 Carlin had a comedy recorded in 1961 and released in 1963 with his partner Jack Burns. In 1964 his first solo LP was pressed - a promotional album numbering only five hundred copies, a commorative record for conventioneers for whom he performed. There was a time when Carlin's material was clean and his face clean shaven. That version of Carlin can be seen nightly on an infomercial for Johnny Carson DVDs, in which a 1966 Tonight Show panel has Carlin performing his character Al Sleet, the Hippy Dippy weatherman, and is well-known. But there was a lot more to his early years than most realize. He was a regular on game shows. He was featured in a Doris Day movie. He was the opening act for the family band the Cowsills when the group played a concert in Disneyland. All things one normally doesn't associate with George Carlin. The early, square years of Carlin's show business career remain enigmatic; a story untold. His early years were not profound or important like his often-scathing, intellectual material of later years - but they are a fascinating look at a formative comedic period - and George Carlin's evolution into an artist. WFMU is pleased to announce the addition of a brand new podcast to our roster: Airborne Event Dronecast. Dan Bodah, who enchants the airwaves each Sunday morning (6-9am) with his freeform program, Airborne Event, will now be doing double-time, filling your MP3 player with a weekly transmission of drones found in the field. Space out to lovely field recordings, sometimes manipulated or layered into multitrack compositions, featuring droney atmospheres like waterfalls, generators, frogs, subway trips, machines, etc. Click here to subscribe via other readers. Our "Codpaste" podcast series is now drawing to an end, and as a celebration this we're following what is almost a tradition for Vicki and Ergo - to put the Finale show, a 96 minute MEGAMIX of the Best of Codpaste, as a download on the WFMU blog! Do not play while operating machinery or trying to count. If you enjoy this great slab of joy, maybe you'd like to listen to the other shows, which are archived below. Vicki and Ergo ride their little bicycles with square wheels and honky hooters and tell you about their love of this funny music. Features, amongst others, the music of Carl Stalling, Roger Roger and BBC Radiophonic Workshop, all collaged with conversation and ridiculously pointless repetitions. Ergo and Vicki show you how fast they can juggle without dropping everything, or at least make very fast music. They play you some of their very favourite speedy rhythms, generally all at the same time, then when it's finished they start it all over again. Features amongst others, different versions of William Tell Overture and Hungarian Rhapsody, and also the misc of Spike Jones, The Comedian Harmonists and Offenbach. In which Vicki and Ergo revisit the 1970's phenomenon of Hooked On Classics, classical cover versions as well as all things light, orchestral and popular. Features a medley of the best of this fine mulch of classical music with a disco beat, as well as some tangential visits to the world of amateur orchestras. Features Portsmouth Sinfonia, The Swingle Singers, John Oswald and Wendy Carlos, amongst others. DJ/Rupture now has a podcast! WFMU is pleased to have added a new podcast to our ever-expanding roster: we're now podcasting DJ/Rupture's weekly show, Mudd Up! Head over to our podcast page to sign yourself up for a weekly dose of Cumbia, Dubstep, Maghrebi, sound collage, expert turntablism, and a smattering of fun guest DJs. Be sure to also check out DJ/Rupture's blog, record label Soot, and his latest collaborations with Andy Moor (of The Ex). If about a zillion hours of WFMU podcasts aren't enough to keep your gigs filled, check out Bowed Radio. Ohioan Mark Allender's sometimes weekly, 45-minute podcast is dedicated to stringed instruments of the bowed variety, and ranges from new music to pretty pop to jazz and stranger things. He's up to 53 episodes now, and past shows have been hosted by the lovely likes of Carla Kihlstedt, Jon Rose, Kristen Hersch and Darol Anger (Although it looks like he might have retired the guest host idea). A quick scan of the 'artists played' list shows he hasn't yet included Charlie Daniels or the Electric Light Orchestra, but there's still time. WFMU is pleased to announce Codpaste - a new weekly podcast series brought to you by our own People Like Us & Ergo Phizmiz, who will be teaming up and trying to compose collage music for you... with emphasis on the word "trying." It's reasonably rare that music is broadcast to you when it's not all finished, polished and dusted, but we're going to spew out the guts and gore to you, dear listener, so do bring a spoon. (ii) sketches, mixes, and collages combining track elements with added instrumentation, electronics, vocals, etc. These elements will be tied together by snippets of light-hearted, tangential conversations and introductions and occasional mental overload and verbal meltdown. Subscribe to this free weekly podcast (and receive an introductory welcome into your iTunes) by visiting WFMU's Podcast page. Further program information can be found here. 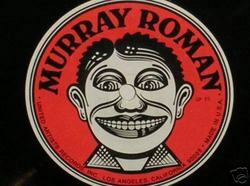 The Forgotten Murray Roman was the name of an article posted a few weeks ago about a counterculture stand-up comic who is none-too-famous today. Perhaps the one living person who can tell us the most about Murray Roman is the man who hired him as a writer on The Smothers Brothers Comedy Hour, Tom Smothers. Here is the transcript of a conversation I had with Tom a few days ago. Tom Smothers: You Can't Beat People Up and Have Them Say I Love You? lt's relevant now, isn't it? Kliph Nesteroff: Yeah, it's a very interesting record and I feel that Murray Roman... is a neglected sorta person in comedy history, y'know. TS: Yeah, I agree. I agree, man. Okay. KN: He actually released four records in his career, but I guess that one is the most famous. TS: And that was the best one, isn't it? KN: Well, I actually haven't heard any of the others - they're quite scarce. KN: So ... where did you first meet Murray Roman and when was the first time you saw him perform? TS: I saw him perform back in the sixties... nineteen... sixty-one... in Aspen, Colorado and he did ski jokes. Y'know, skiing jokes and cold... snow jokes. And I met him there... and in L.A. later on... in sixty-five and sixty-six, I'd run into him and see him work a little here and there. When we got The Smothers Brothers Comedy Hour, which was nineteen sixty-six... I hired him as a writer on the show... and I always considered... good comedians were always pretty good writers, I always thought. And he was a pretty good writer. Most of his gift was sitting in the writer meetings and throwing one-liners out against the material. That's how he'd find his stuff. He didn't write so well - he talked his writing. We had a couple little pieces where he's on stage on the show... he didn't perform that much on the show... but the reason I hired him was because of that album. Eugene Harold Mashontz was a funny comedy writer and performer who seemed to specialize in playing vampires, mad scientists and silly characters with a classic-monster bent. Monsters were big from 1957-1967, especially with children fascinated by all things Frankenstein, Dracula or Wolfman. Famous Monsters was a best-selling magazine (it even spawned an LP), Bobby "Boris" Pickett's Monster Mash was a number one single, Milton the Monster was a popular cartoon, The Munsters and The Addams Family were sitcoms that debuted in the same week, and every city seemed to have a Late Late Show of classic horror movies hosted by a local personality draped in make-up, surrounded by coffins and cobwebs. Into the mix came Gene Moss. The market was flooded with novelty recordings sung by the living dead after the success of Monster Mash. The list of monster related novelty music is too huge to tackle today, but one of the greats was a full length LP that featured the masterful vocal talents of Gene Moss. 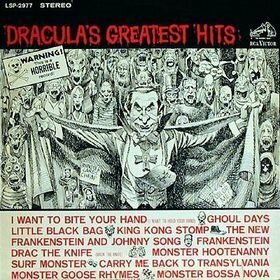 It was called Dracula's Greatest Hits. Get your Halloween party started right by listening to the entire, very scratchy, LP here. Moms Mabley was one of the greatest comedians of all time. She is widely regarded as one of the most important African-American entertainers that ever lived and as the first bonafide female stand-up comedy superstar. At her peak she was making ten thousand dollars a week for stage appearances alone. It is ludicrous that a book has never been written about this comedy legend.1 Moms was one of the first, perhaps the first, to advocate for civil rights from a comedic perch. The social issues that boiled over in the late sixties were something Mabley had been addressing for decades. When the struggle against war, racism and varied discrimination became the focus of a new generation, Mabley suddenly found herself a bigger star than before, her message embraced by those involved in the fight. Television programming geared to the new youth market regularly booked Mabley and white viewers discovered the joy that the Black community had known about for years. The Smothers Brothers Comedy Hour booked Mabley several times. So did ABC's Music Scene. Both of these television shows fell victim to controversy when a jingoistic establishment objected to their progressive politics.2 Yet Moms Mabley, their occasional guest star, managed to take on the same bullheaded power structure and get away with it. Mabley convinced her audience that she was a harmless, placid grandmother. By the time she left the stage, she had lectured on war, segregation and a racist society she had fought her entire life. An audience convulsed, ribs sore from jubliant hysterics, would walk out of the theater having been hipped to the struggles of a woman, a race and a generation. Most did not even realize it. Hanna-Barbera will always be synonymous with their "Saturday morning assembly line" as 60 Minutes once described it. Although their cartoons were never synonymous with quality, the endless stream of licensed merchandise that was churned out to cash in on the popular HB characters was even more dubious. From their weird line of cigarette smoking figurines to the incorrectly colored comic book adaptations, Hanna-Barbera products rarely achieved even the marginal quality of the cartoons they were based on. There is an exception to this rule. In 1965, after six years of licensing their characters to the Colpix and Golden record companies, they founded their own label, Hanna-Barbera Records. The company put out, as you might expect, albums based on The Flintstones, Atom Ant, Touché Turtle et al. However, they were also responsible for some of the most impressive (and now sought after) garage rock, psychedelia and rugged soul music of the era - and indirectly spawned a band called Three Dog Night. Carl Smith "The Bottle Is Just Fooling You"
Hank Williams "There's a Tear in My Beer"
Mr Swing "Beer Bottle Boogie"
Webb Pierce "There Stands the Glass"
ZZ Top "Beer Drinkers and Hell-Raisers"
Hank Thompson / Bob Wills "Bubbles In My Beer"
Thinking Fellers Union Local 282 "Cup of Dreams"
A.C. Ducey "Beer Beer Bottla Beer"
Cat Stevens "Bring Another Bottle Baby"
Matching Mole "Starting In The Middle of the Day We Can Drink Our Politics Away"
Bob & Doug McKenzie "Beer Hunter"
The Tiger Lillies "Lager Lout"
Space Needle "Beers In Heaven"
Bessie Smith / Billie Holiday "Give Me A Pig Foot and a Bottle of Beer"
Homer Simpson "It Was A Very Good Beer"
Johnny Russell "Red Necks, White Socks, & Blue Ribbon Beer"
Joe Belock "Daddy Wants A Cold Beer"
Wreckless Eric & Amy Rigby "You can't be a man without a beer in your hand"
Frank Zappa "Rudy Wants to Buy Yez a Drink"
Claude King "51 Beers" / "Beers & Pinball"
Light Crust Doughboys "Beer Drinking Mama"
Rocky Bill Ford "Blowing Suds Off My Beer"
Smiley Maxedon "Give Me A Red Hot Mama and An Ice Cold Beer"
Kris Kristofferson "To Beat the Devil"
Ill Ease "One Hell of a Bender"
2 Nice Girls "I Spent My Last $10 on Birth Control and Beer"
Captain Beefheart "Long Neck Bottles"
Mario Lanza "Drink, Drink, Drink"
Been drinking a lot of beer this summer. Most of it on the radio. Mmm mm mm, that's so nice I want to watch beer movies. Let's see what youtube can contribute. The legendary Bonzo Dogger swallows the worm and dives down his own peculiar rabbit hole in order to shill for swill. Or is it Kirin Lager's ad for Yellow Magic Orchestra? The tables turn when they start flashing snapshots of the Band As Young Men. The co-cap'n of Tropicalia and Brazil's current Minister of Culture shouts out not just free beer, but GOOD beer! Next week, more zymurgological ephemera -- Beer songs!! I'd love to hear your suggestions in the comment section of this post. Meanwhile, at 2:40 this afternoon (and every Friday thoughout the Summer 2007 WFMU air schedule), I'll be drinking and talking about beer on the air with a bunch of pals. Today we'll be sampling suds provided by Listener / Volunteers Therese and Colleen. I'm podcasting this weekly 20 minute debauch (and even occasionally the after party), feel free to subscribe here. There's even a flickr set devoted to the afterparty. Past beer posts here and here. Past beer-obsessed radio shows via all this. 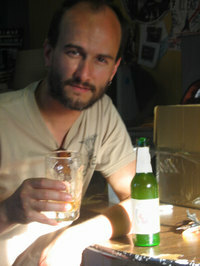 Happy hour begins early here at WFMU, thanks to a new segment on Scott Williams' program: Scott's 2:40 Beer Tasting. Now available as a podcast, you are cordially invited to imbibe Scott's weekly choice of brew along with his rotating panel of beer enthusiasts. 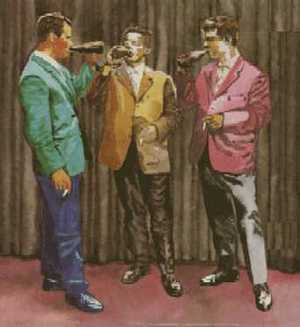 Why there's Scott on the left, raising his (mostly-empty) glass to salute all of you new podcast listeners. Plan ahead for the coming weeks of 2:40 fellowship by visiting Scott's playlist page. 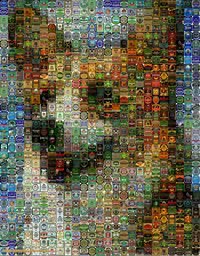 Subscribe to the 2:40 Beer Tasting podcast by hitting up WFMU's Podcast Central, or just open up iTunes, go to Advanced - Subscribe to Podcast, then copy and paste this link into the box. Ok, I can't take it, that photo to the left is too hilarious. Let's have some fun: create your own caption in the comments section.